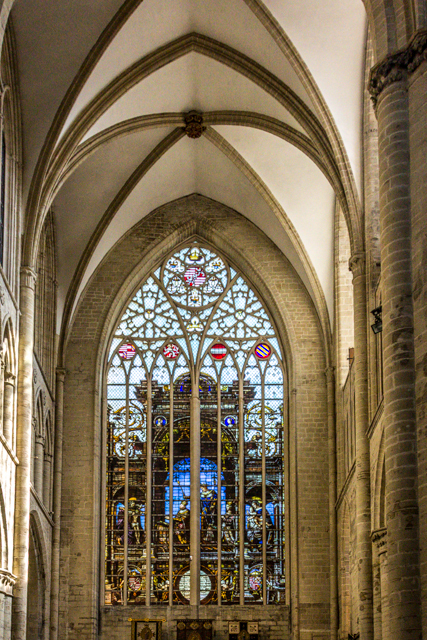 The church of St Michael and St Gudula, begun in 1226, was nearing completion three hundred years later when Charles V took over the reigns of the Holy Roman Empire — just in time for the installation of the stained glass windows dedicated to himself and his family. About half of the windows we saw last year were the originals that Charles paid for. There were also a handful from the 17th century. The rest of them were installed during a massive restoration project in the middle of the 19th century. 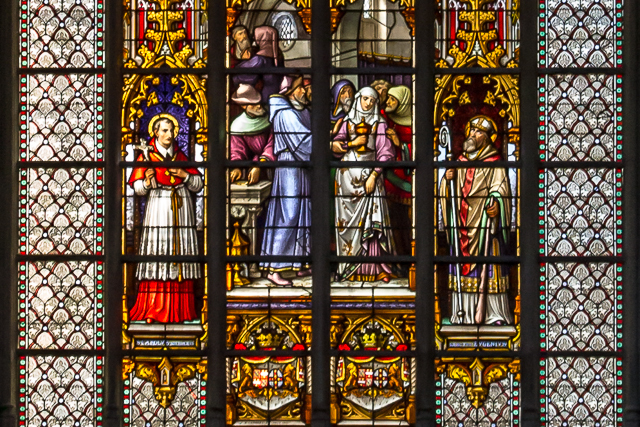 One of many window installed in the 19th century by Jean-Baptiste Capronnier. The oldest window in the cathedral sits above the main portal in the west facade. It depicts the Last Judgement and was installed in 1528. Some people think it was the work of Frans Floris but others are not so sure. The Last Judgement was installed over the West Portal in 1528. 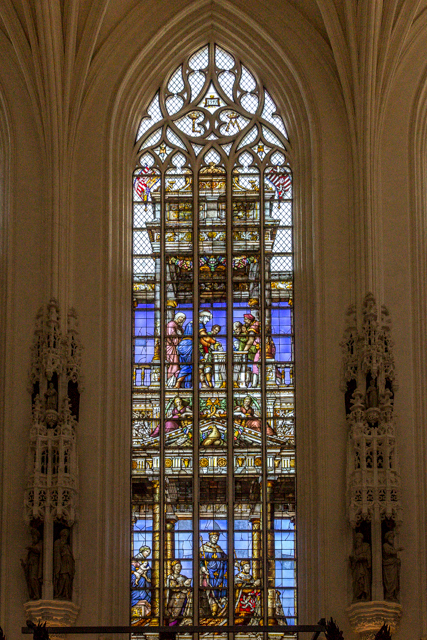 Jean Haeck is credited with producing both of the cathedral’s transept windows. The north transept was completed in 1537 and is based on a drawing by Bernard van Orley. Charles V himself is the star of this show. The south transept window was completed a year later and is also based on a drawing by Orley. It features King Louis of Hungary with his patron Saint Louis and his wife Queen Mary who just happens to be the sister of Charles V. The Virgin Mary and her Infant are the Queen’s patrons. 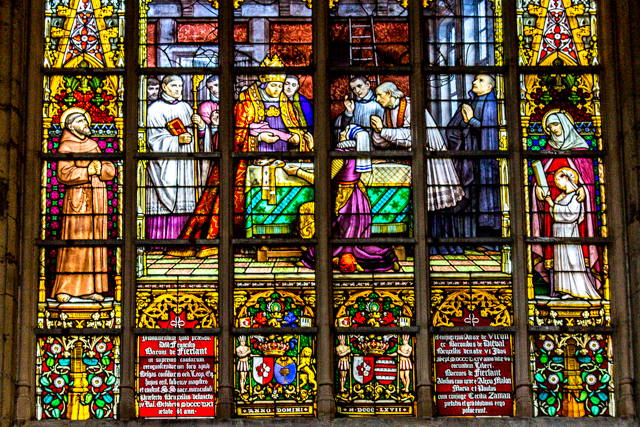 Detail, north transept window, showing from right to left: Charles V, his patron Charlemagne, his wife Isabella, and her patroness St Elizabeth of Hungary. The South Transept dates from 1538. Detail, south transept, showing from left to right Louis II of Hungary, his patron St Louis, his wife Marie (sister of Charles V) and her patroness the Virgin Mary with her Infant. 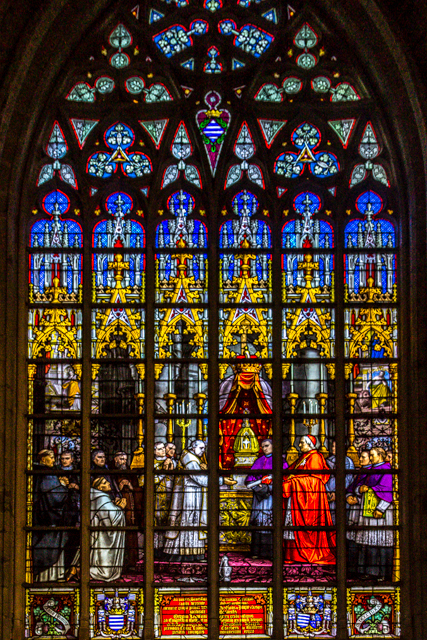 Charles and his whole Hapsburg family are featured in the five windows high above the Choir: The first window is a portrait of the grandparents of Charles V: Maximilian I of Austria (also Holy Roman Emperor) and his wife, Queen Mary of Burgundy. 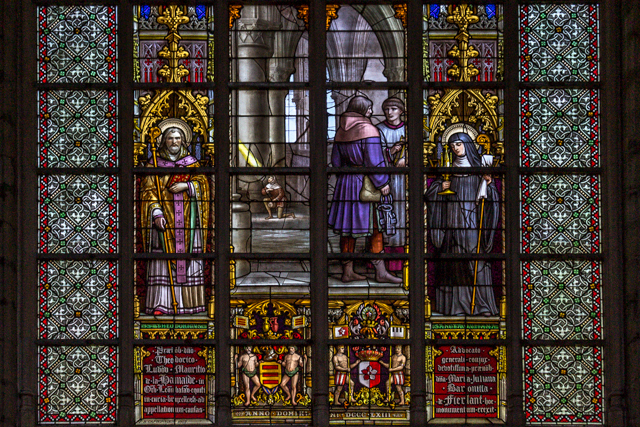 The second window shows their son Phillip the Handsome and his wife Johanna of Castile (daughter of Ferdinand and Isabella). The third window consists of their sons Charles V and his younger brother Ferdinand who succeeded him as Holy Roman Emperor. The fourth window is a portrait of Phillip II, son of Charles V, who succeeded him as King of Spain. The final window is of Philibert, Duke of Savoy and his wife Margaret of Austria, aunt and godmother of Charles V. Margaret raised her nephews Charles and Ferdinand while governing the Low Countries, first for her father Maximilian and then for Charles. Three of the five windows above the choir. On the left are Maximilian I and his wife Mary (grandparents of Charles V). In the center are Phillip the Handsome and his wife Johanna (parents of Charles V). On the right are Charles V and his younger brother Ferdinand I. 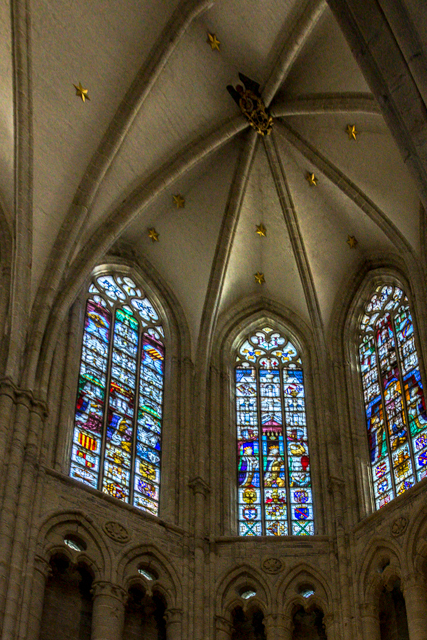 The art experts claim that the best windows in the cathedral are the six that can be found in the Chapel of the Holy Sacrament north of the choir (and east of the north transept). 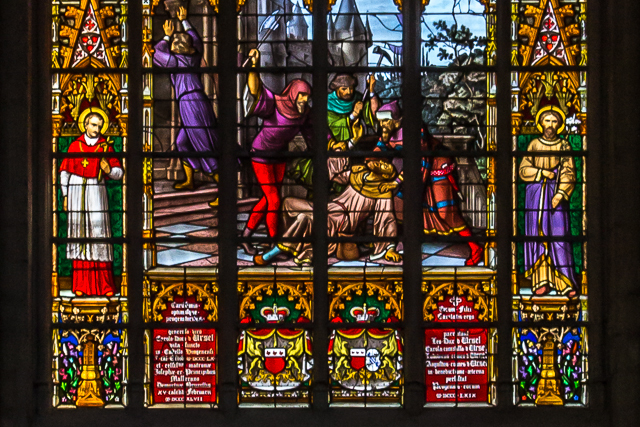 The first four of these windows were made by Haeck in the 1540s. The fifth was also by Haeck but almost completely restored in the 1840s by Jean-Baptiste Capronnier of Brussels, one of the most admired glass makers of the 19th century. The sixth and final window is all Capronnier. 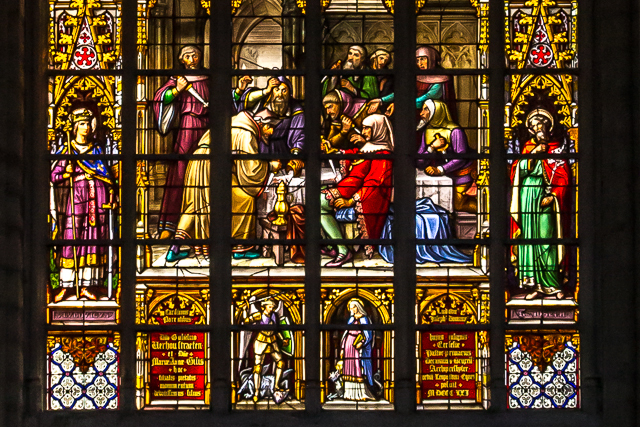 The upper half of all six windows tell the story of the sacramental hosts stolen by Jews on Good Friday in 1370 and while being desecrated by daggers in a synagogue miraculously bled. The hosts were retrieved and six Jews were burned at the stake in the middle of the Grand Place while others were banned from Brussels forever. The Chapel of the Holy Sacrament was built to store these hosts plus other treasures. This 600-year-old story, conceived in days of extreme bigotry and persecution, is still popular today and the story and its associated miracles is celebrated annually at the cathedral on the Sunday following the 15th of July. The second of five windows in the chapel of the Holy Sacrament. The upper half depicts a scene from the Story of the Stolen Host. The lower half portrays Louis II of Hungary, his patron St Louis (King Louis IX of France), his wife Maria (sister of Charles V), and the Virgin Mary with her Infant. The upper half of another window showing another scene from the Story of the Stolen Host. Another scene on another window of the Story of the Stolen Host. The lower half of these windows is again reserved for Charles V and his family and their respective patron saints. 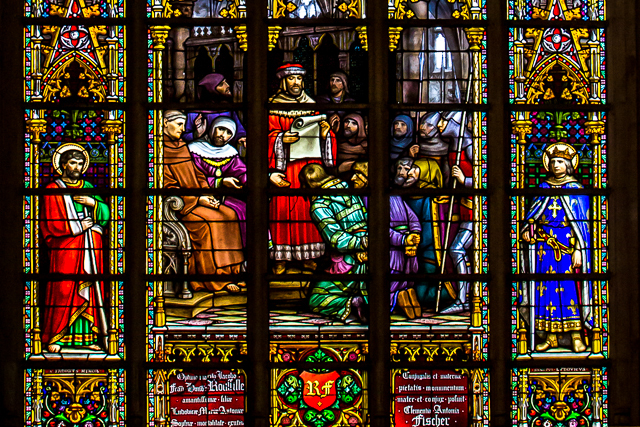 The first window is John III of Portugal and his wife Queen Catherine, a sister of Charles V; the second is of Louis of Hungary and his wife Marie, another sister of Charles V; the third is of Francis I of France and his queen Eleanora, a third sister of Charles V; the fourth is of Ferdinand I of Austria, brother of Charles V, and his wife Queen Anne (sister of Louis of Hungary); and the fifth is Charles V himself with his wife Isabella (sister of John III of Portugal). Charles and Isabella were first cousins. 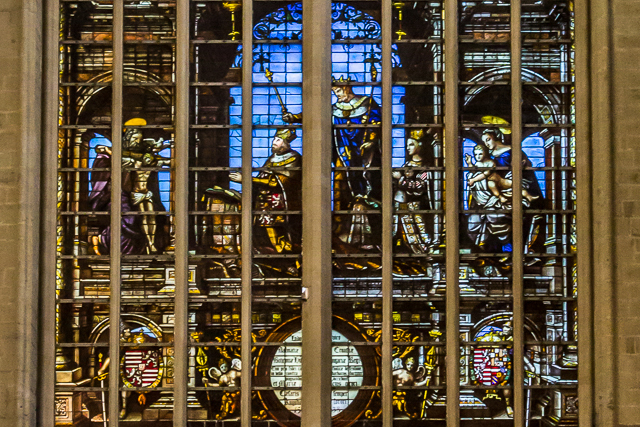 Some of the rest of the windows in the church were executed in the 16th century by Nicolas Rombouts, who lived in Mechelen, a master glass-painter to the Court of Margaret of Austria. Charles V was born in Ghent but was raised in Mechelen by his aunt Margaret where she lived when she governed the Netherlands. 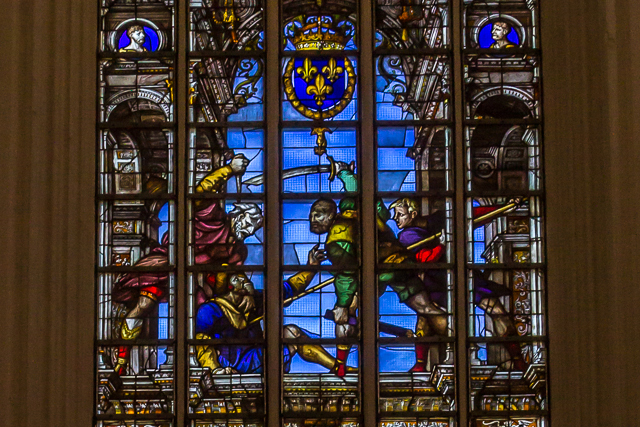 Four of the six windows in the Chapel of Our Lady of Deliverance were executed in the 1650s by Jean De Labaer of Antwerp, from designs by Theodor van Thulden. The other two are 19th century recreations by Capronnier. All of the other windows in the church were produced by Capronnier between 1848 and 1880. Jean-Baptiste Capronnier (1814-91) learned his trade from his father Francois. He took over his father’s workshop in 1840 and his reputation soon spread throughout Brussels and other cities (Brugges, Antwerp, Ghent) in Belgium and to Amsterdam in Holland. In 1843 he installed his first window in St Michael and St Gudula (in the east hexagonal Chapel of Magdalene). He exhibited his work in the Great Paris Exhibition of 1855 and was the only glassmaker to receive an award. 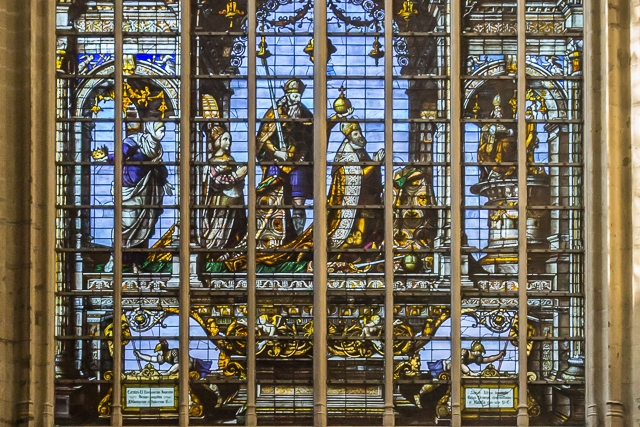 He also participated in the Great Exhibition in London in 1851 and many of his windows can be found in Anglican churches in England, especially in the Yorkshire and East Yorkshire areas, and in some Churches of Ireland. Capronnier believed in restoring medieval art to look like it originally did. Others believed that restoration should go beyond the original work of art and be more pleasing to the modern eye. 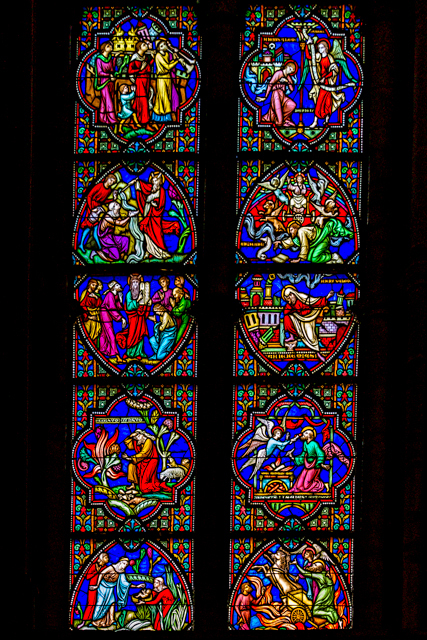 Some of Capronnier’s windows in the ambulatory depicting familiar stories from the Bible were produced in 1879 to look like art from the 13th century. 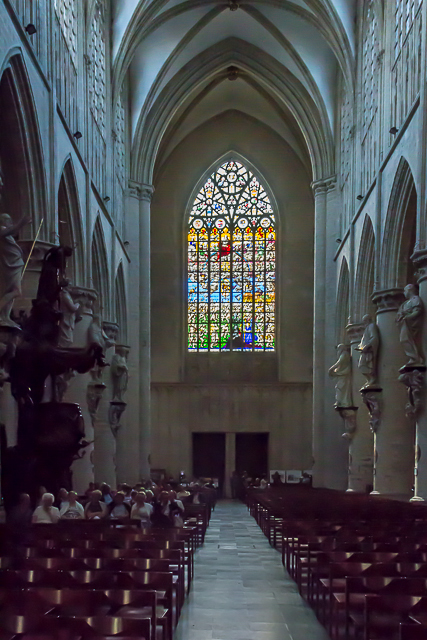 All of the windows in the nave were produced at a rate of one per year between 1860 and 1880. And they bring up again the story of the Stolen Hosts. 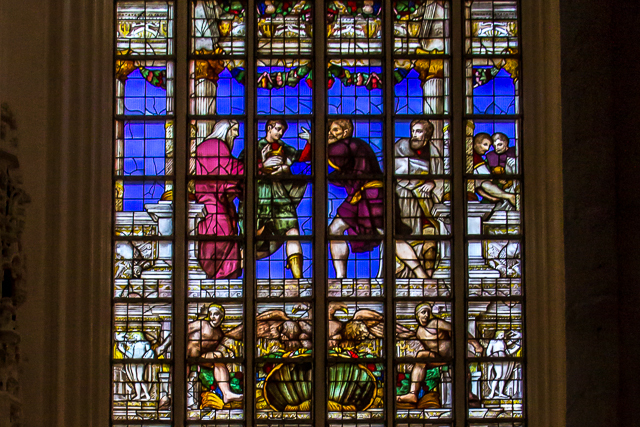 Some of the windows depict the same scenes that are already presented in the 16th century windows of the Chapel of the Holy Sacrament. 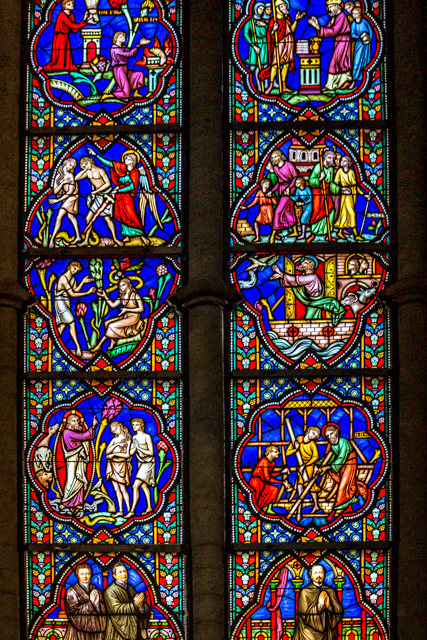 Some examples of Capronierr’s nave windows that depict the Story of the Stolen Hosts. The story begins with the first nave window to the right of the south transept and continues on through the north nave wall all the way to the north transept. This window was installed in 1863. The desecration of the hosts. This window is dated 1871. Continuing the Story of the Stolen Host (1867). This window was completed in 1869. The conclusion of the story (1870). Capronnier was an accomplished artist himself but he also employed some of the best oil painters in Brussels to produce the cartoons for his glass, among them Francois-Joseph Navez, Constantin Meunier, and Charles de Groux. One of Capronnier’s ambulatory windows in the style of the 13th century. Postscript: Charles V was born (1500) in Ghent and raised in Mechelen. He lived at times in Spain but preferred to rule his empire from Brussels. Crippled with gout, he was forced to abdicate in 1556 and was succeeded by his son Phillip II as King of Spain and by his brother Ferdinand I as Holy Roman Emperor. He returned to Spain and lived in a monastery until his death in 1558. In my next posting we’ll take a look at some of the statues inside the cathedral. This entry was posted in Art, Belgium, History, Travel and tagged Brussels, Cathedral of St Michael and St Gudula, Charles V, church photography, Holy Roman Empire, Jean-Baptiste Capronnier, photography, stained glass windows, story of the stolen hosts, travel, travel photography. Bookmark the permalink. Very well documented posting, Jerry! You certainly are very enthusiastic about the Brussels cathedral, and particularly by its stained glass windows. I expect that next year we will see throngs of visitors – your blog-readers – wanting to see for themselves what you so admirably described ! Brussels tourist office, you have been warned !! Hi, George. Thanks for the kind words. I’m working today on my posting on the statues I saw in the cathedral. I think I ‘ll have 2 or 3 more postings on Brussels and then will have to start planning for our trip to London this Fall. Wow, the stain glass looks amazing. It truly enhances the church! Great photos with great detail and color. I think I got more out of your posting than I did a whole semester of art history. Of course that was a bunch of years ago. And thank you for stopping by Renaissance Musings and liking several posts. Thank you for the information on the Last Judgement and transept windows. I was looking for the dates of their installation, and you had them. I appreciate your research and descriptions.